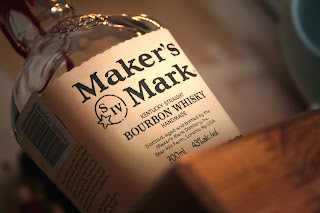 Well I am on the bourbon trip at the moment and wanted to express my views on the Maker's Mark Bourbon. My bias of course is because of my preference for Scotch whisky and the more I have bourbon the more I prefer Scotch. Two things drew me to this bourbon. First and foremost, was The Secretaries note to me to try it...and of course, he says and I do (be-atch)! Secondly, was finding out that the used casks from Maker's Mark are indeed the ones that go to the Laphroaig distillery so I was keen to see if I could find any of those flavours I so dearly love about Laphroaig Cask Strength. Like all bourbons I am finding that there is not a great deal of variation is flavours or styles. Corn is always present as is sweet charcoals and caramels. Look through multiple market leading bourbon distillery websites and you will find they have very little to say ever about their whiskys as a flavour point of difference. Unlike Scotch whisky which can be so much influenced by region and or the terroir, bourbons just don't seem to change (as yet for me, though The Secretary had a bourbon that just tasted 'strange', like when someone introduces their wife and later says she is also his cousin, but I will leave that one up to him to describe). So my review is ever so brief. Corn, old straw, charred maple and dry on the pallet. Finish is quick and ordinary. Overall old straw and dry grass clippings is prolific from start to finish. Easy to drink if all you want to do is drink and chat and not focus on the flavours. You could sip this all night and need another sip just to pick up the taste again as it disappears so quick. As the Grey Bush and myself discovered if you add ice it becomes slightly sour and left the ice melt it just becomes god awful. Did I find anything in the taste relating to the Laphroaig? No. Nothing that stood out to me unfortunately, though Steve did find something (but then he has demolished quite a few bottle of Laphroaig in the last year). If I was to give a dram 4 out of 7. A whiskey to have when your not having a whisky. Things I like about the Marker's Mark is the bottle. The hand dipped wax seal makes for an interesting touch. As side note: When we went to the Bruichladdich tasting and the rep was doing his thing there was the occasional snipe about other distilleries and how they (as a generalisation) 'colour their whiskys' but of course Bruichiaddich don't. This totally brought down my respect for the distillery. Whisky, like anything eaten or drank, is all about taste and not how it is made. You do not buy it because you are 'told' this is the best. If it tastes bad you don't keep buying it unless you are stupid.